Israel is said to have struck Syria overnight Sunday-Monday, the second strike in 24 hours and third in three days as tensions escalated between the two countries over the weekend. 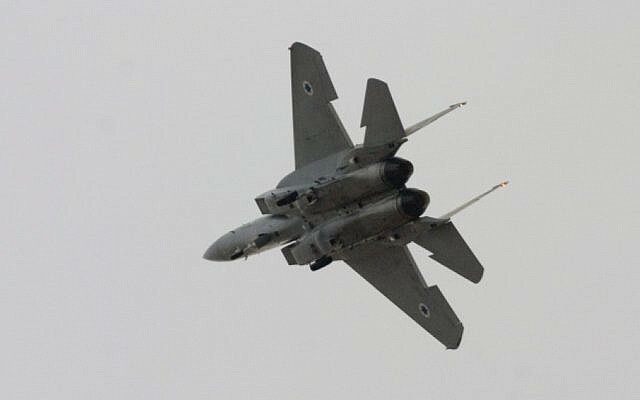 Syria media reported early Monday that Israeli jets took out a number of targets near the Lebanon-Syria border including a Hezbollah weapons convoy and Syrian military sites. Earlier Sunday, an Israeli drone strike reportedly killed a member of a Syrian pro-regime militia, an attack that came two days after Israeli jets, in an early Friday morning operation, hit an arms transfer meant for Hezbollah near Palmyra, with Syrian air defenses firing missiles at the planes. One missile was intercepted by Israel’s Arrow missile defense battery, military officials said, in the first reported use of the advanced system. It was the most serious incident between the two countries since the Syrian civil war began six years ago. Speaking on Syrian state TV, Jaafari said the military’s response was “appropriate and in line with Israel’s terrorist operation,” and that Israel “will now think a million times [before striking again],” according to a translation cited in Ynet. His comments came hours after Israeli Defense Minister Avigdor Liberman threatened to destroy Syrian air defense systems for targeting the Israeli aircraft during the bombing run Friday. “The next time the Syrians use their air defense systems against our planes we will destroy them without the slightest hesitation,” Liberman said on Israel Radio. Israeli officials have warned of the possibility Hezbollah and Iran could attempt to set up a base to attack Israel near the border with the Israeli Golan Heights. Last week, Prime Minister Benjamin Netanyahu visited Moscow, where he asked the Kremlin to make sure Iran does not gain a foothold in the area. Israel has also repeatedly vowed to prevent Hezbollah from acquiring any advanced weaponry and several strikes on such convoys over the years since the Syrian civil war began in 2011 have been attributed to Israel. Jerusalem has also claimed several of the raids, including Friday’s. “Each time we discover arms transfers from Syria to Lebanon we will act to stop them. On this there will be no compromise,” Liberman said Sunday. Earlier Sunday, the Britain-based Syrian Observatory for Human Rights said that Israeli aircraft struck a truck driving near the town of Khan Arnabeh in the Quneitra province, on the road to Damascus. The National Defense Force, a pro-regime militia set up in 2012, claimed the man killed was from among its ranks, naming him as Yasser Hussien Assayed. The group, reportedly set up with the help of Hezbollah, published four pictures on Facebook it said were from the scene of the alleged airstrike. The group said an Israeli drone carried out the strike. The Lebanese news channel NBN reported that the man killed was a Syrian air defense commander. Other reports said Assayed was a civilian.